The Whit Whit Walk is a family-friendly walkathon that supports pediatric cancer research at Memorial Sloan Kettering Cancer Center (MSK). Since its inception in 2012, the Whit Whit Fund has raised more than $620,000 to find more effective and less toxic treatments for children with cancer. The Caumsett loop is 3 miles. Snacks and beverages at the finish line. Credit card use will be available. Strollers, wheelchairs and bicycles are welcome. No Scooters. Thank you for your continued support, love and generosity. If you have any questions about this event, please contact the event coordinator at: Tracy@WhitsWay.org or go to: www.WhitsWay.org. Whitney Marie was born on September 27, 2011 at 1:02 am as a beautiful, healthy 6 lb. 12 oz. girl. On November 1st, at five-weeks-old, we noticed blood in Whitney's urine and went directly to the emergency room where a sonogram detected a "mass" in her right kidney. At six-weeks-old, Whitney had her entire right kidney removed at Memorial Sloan Kettering Cancer Center and the mass was diagnosed as a Malignant Rhabdoid Tumor of the Kidney. This extremely rare and aggressive cancer affects young children and only five to ten cases are diagnosed in the US each year. 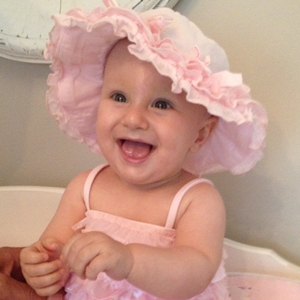 At seven-weeks-old, Whitney started her first chemotherapy treatment. After a brave, ten-month battle, Whitney passed away peacefully on October 8, 2012. Although she was here briefly, her life significantly impacted many people around her. She taught us that regardless of the circumstances, we must always BELIEVE! For more information on Whitney Marie Posillico and her family, go to: www.WhitsWay.org. Colleran, O'Hara & Mills L.L.P.